Here I have cropped and zoomed in to focus on the detail which he is referring to. It would certainly be possible to carve such a pattern into leather without too much work. Nicholas Sekunda has found a vase painting of a whole armour whose face is covered with the same pattern of rhombuses and spots. In his Osprey on Marathon he suggests that these armours were built like a European jack of plates: of three or more layers of cloth inside which small plates were sewn by laces which were visible on the outside and made a geometrical pattern (here is a photo of a jack of plates in the Royal Armouries, Leeds and a photo of an armourer working on a reconstruction). 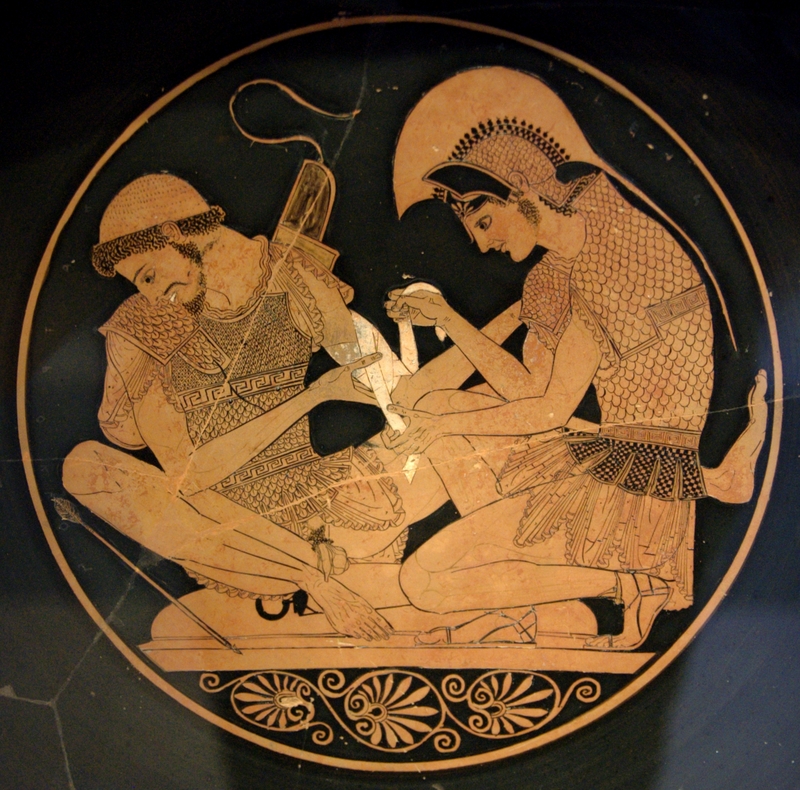 The same vases can be found sketched in Duncan Head’s book and photographed in the online databanks of Greek vases. The resemblance is even closer to Japanese kikkô, which used hexagonal plates sandwiched between cloth, stitched down in the centre, and outlined with colourful silk thread. 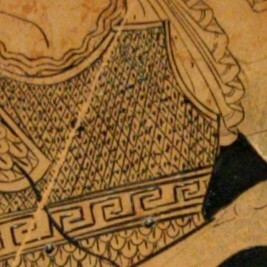 The plates of kikkô are typically very small, no more than 2 cm wide, which would match the small rhombuses on the breast of Patroclus’ armour (I count 26 of them from side to side on its bottom edge). 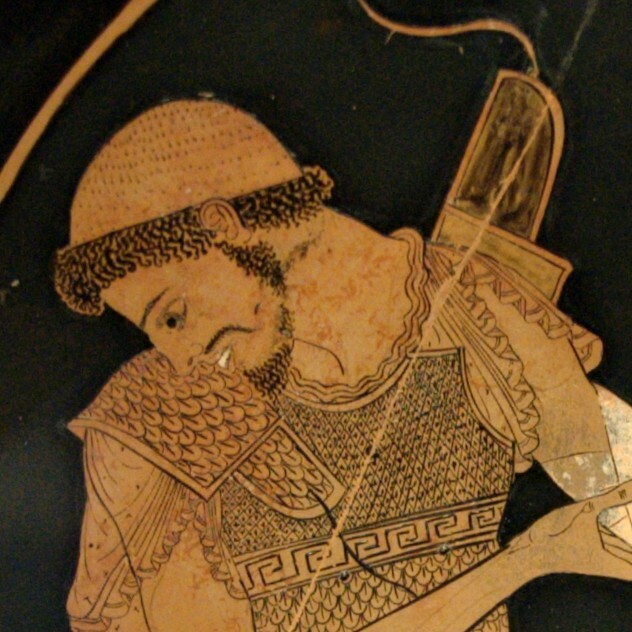 I don’t think that any such small plates have been found from sites of the Achaemenid period, but only a few sites from this period have produced armour scales, and in later cultures such plates were often made of horn or hide which do not survive well. So the lines and dots could also be stitching. I don’t think that paintings can give us enough evidence to rule out either possibility. Both tooled leather and covered small plates would look like the picture and produce the same absence of archaeological evidence. But because they are based on types of armour which were popular in several cultures for a long period of time, they are both reasonable guesses. The same can’t be said for all interpretations of ancient armour.